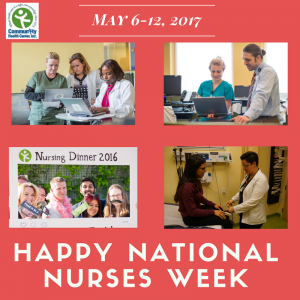 May 6th marked the beginning of a week-long celebration of nursing. Every year I get the great privilege of kicking off the week with a resounding thank you to all the nurses for all they do every single day! I know that all of us here at CHC have experienced the care, expertise, and compassion of a nurse either at work here at CHC, in our personal life, or the lives of one of our loved ones. In reflecting back on my almost 3 years as chief nursing officer, I am reminded of the ways CHC has grown and changed to better serve our complex and ever growing population of patients. We have nurses everywhere at the health center, including our staff nurses, staff LPNs, Nurse Managers and Supervisors, APRN residents, Family, Adult, Pediatric, Psychiatric and School-based health center APRNs, Nurse Researchers, Nurse Leaders, a Nurse Midwife, quality improvement nurses and so many more! We are in every part of the state—from Hartford and Enfield, all the way down to Fairfield County and New London County. We should all be celebrating the impact of nurses on the care that we deliver every day —as our nurses work hard to ensure better, more robust care for our patients. They have an increased awareness and interest in training the next generation of care team members in high quality primary care, and they contribute to the development of innovative practices and interventions that set a national standard for what we know should be the model of care everywhere! We continue to be proud of our innovations including: The celebration of the 10th year of our APRN residency program (the first in the nation), the continued implementation of the nation’s first dedicated education unit for baccalaureate nursing students focused on primary care, the completion of the first two years of curriculum for our Complex Care Management Project ECHO Program, our LPNs continuing to expand their practice, including delivering medical services to patients here to see their behavioral health and dental providers, the continued expansion of our SBHCs and even the continued work we have done through our National Cooperative Agreement to support other health centers around the country to implement team-based care or their very own residency program. I am sure there are so many more innovations! The nursing role here at CHC will continue to evolve and expand as we continue our firm dedication to setting a national standard, sharing that standard—and creating partnerships with like-minded folks all across the nation! It is truly a great honor to recognize every CHC nurse this week—and I hope you will all join me in thanking a nurse near you for their dedication and commitment to all we do!